The care of elderly patients, particularly those with dementia, is very high on the agenda for the NHS. Across the board it has been widely acknowledged that more should be done to support patients with dementia, their carers and the staff that are looking after them. Here at North Bristol NHS Trust (NBT), and in partnership with colleagues at neighbouring University Hospitals Bristol NHS Foundation Trust (UH Bristol), we have begun rolling out a series of measures to make caring for patients with dementia a top priority. 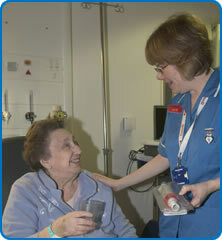 The Trust have established a dementia care team with medical, nursing and training leads. There is an improvement plan which is based on the hospital standards in dementia care and the team are working with this to implement changes. Dementia champions: All wards and departments have identified dementia champions who receive additional regular training and support. Their role is to support patients with dementia and staff by promoting good practice in this area and they also provide feedback to the dementia care team. Environment: The trust was awarded £15,000 from the Prime Minister’s Dementia Challenge funds to improve the environment of care for people with dementia. This money has been highlighted for wards on level 5 where the many of people with dementia will be during their stay. Changes include clocks for every patient room, larger white boards so nurses can write information for individual patients, a sign on the bathroom door, a door hook so that the “This is me” document can be available for all to read, corridor seating and a reminiscence wall to provide a focal point for discussion. Nutritional care: Specific assessments for elderly patients to make sure they are eating and drinking enough have already been rolled out across the Trust. Elderly patients are particularly susceptible to malnutrition and we are committed to ensure that this doesn’t happen whilst they are with us. Together with the Alzheimer's Society we are improving the support we provide to carers of people with cognitive impairment/dementia. Every Wednesday from 2pm-4pm there will be a drop in dementia café on Level 5, Gate 28, Brunel building, Southmead Hospital, Bristol. At the Café you will be able to access information about dementia, be signposted to local services for support and find out how you can help your relative to live well with dementia. Tea, coffee and cakes will be available. We look forward to seeing you there.